Liquid water is an essential ingredient for all life on Earth. With 70 percent of its planetary surface covered by water, Earth is unique in the solar system. 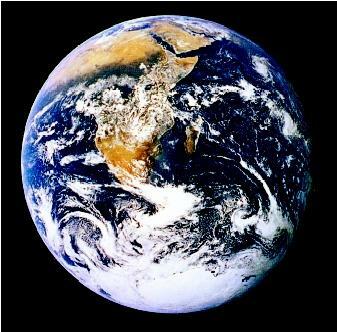 Earth is the only planet known to have indigenous life; yet water, mostly as water ice, is found throughout the solar system. Why is water so abundant on Earth? The answer lies in the materials from which the planets were formed, the conditions under which the planets formed, and the properties of water. Hydrogen and lesser amounts of helium were the most abundant ingredients of the "chemical stew" from which the solar system emerged. Oxygen, one of the most common products of nuclear fusion, is found throughout the molecular clouds from which new stars and new solar systems are born. Oxygen combines with hydrogen to make H 2 O, or water. In the solar system, inward of the asteroid belt , oxygen combined with elements such as silicon, aluminum, and calcium to make minerals and rocks that formed the inner terrestrial planetary bodies (Mercury, Venus, Earth, the Moon, and Mars). Beyond the asteroid belt, in the colder conditions of the outer solar system, water condensed to form ice grains that were incorporated in the giant planets (Jupiter, Saturn, Uranus, and Neptune) and their moons. Other than on Earth, there is no known surface water in the solar system. Given present knowledge, water in space is believed to exist only as ice, and often as subsurface ice. Mercury, the closest planet to the Sun with an average distance to the Sun of 0.387 astronomical unit , or about 58 million kilometers, is in a very unusual elliptical orbit around the Sun. It spins three times around its own rotational axis for every two times that it orbits the Sun. This results in the greatest range of temperature extremes in the solar system. Daytime surface temperatures on Mercury can rise to 800 kelvin, then fall to 90 kelvin during the night. In other words, temperatures can range from about 525°C (980°F) down to −180°C (−297°F). Although Mercury is one of the Earth's closest neighbors in the solar system, it has been studied very little and the majority of detailed information on the closest planet to the Sun was gathered during three Mariner flyby missions during 1974 and 1975. Mercury's closeness to the Sun makes it particularly difficult to observe with conventional telescopes, but advances in radar techniques in the 1990s revealed large deposits of possible water ice (equivalent to thousands of cubic kilometers) in permanently shaded craters near the poles of Mercury. The cloud layers that permanently shroud Venus are largely composed of carbon dioxide and sulfur gases, but include water vapor. In a runaway greenhouse effect , the clouds reflect the thermal energy radiated from the surface of Venus back onto the surface, resulting in the high surface temperatures of around 450°C (842°F). However, this may not always have been the case. Studies of the decomposition of hydrous minerals (minerals that contain water) at extreme temperatures provide tentative indirect evidence that Venus may have had surface water in the past. The hot and dry Venus of today may have been a wet planet in the past, like Earth and ancient Mars. Water that was present during the formation of Earth and the other planets was incorporated into the bedrock of the planets or on their surfaces. Much of the water on Earth today may have been delivered by cometary and asteroidal bombardment several hundred million years after the planet formed. That includes the water in the atmosphere, the oceans, the polar caps and glaciers, in human bodies, and in all other living things in the biosphere. The existence of water ice in polar regions of the Moon was first suggested in the late 1800s. The Lunar Prospector mission, launched in January 1998, carried an instrument that detected possible indications for water ice at both the north and south poles of the Moon. While some scientists contemplated deep frozen reservoirs in permanently shaded craters, the widespread nature of the signals suggest the water may be bound up in clays. The possible presence of water on the Moon—in any form—would be a great natural resource for future human missions (for propulsion as well as drinking water) and would provide valuable information about earlier conditions in the Earth–Moon system. Water is certainly present on Mars. There is water vapor in the Martian atmosphere that forms into white clouds, fog, and frost. Water ice exists in a residual polar cap at its north pole. Images provided by the Mars Global Surveyor spacecraft suggested the existence of subsurface water on Mars, and the Mars Odyssey spacecraft confirmed the presence of significant amounts of subsurface water on Mars via gamma-ray spectrometer measurements of subsurface hydrogen. These measurements indicate the presence of a considerable amount of water a few meters below the Mars surface. Further discussions of water on Mars may be found elsewhere in this encyclopedia. Many planetary scientists believe that cometary impacts early in Earth's history could have supplied much of the water for its oceans. Further discussions of asteroidal and cometary water may be found elsewhere in this encyclopedia. The outer solar system is locked in a permanent ice age. Even so, water is present in the atmospheres of Jupiter, Saturn, Uranus, Neptune, and Pluto. Uranus and Neptune contain much larger proportions of ice-forming and rock-forming constituents than Jupiter or Saturn. Density and gravity field data for Uranus and Neptune, together with theories of the formation of those gas giants, suggest that both have massive global oceans of water ice. Water condenses in the atmosphere of Jupiter. When the Galileo spacecraft arrived at Jupiter in 1995, it released a probe that measured levels of atmospheric water significantly lower than the expected abundance; however, the probe unexpectedly descended through a very dry part of the Jovian atmosphere. Liquid water is theorized to exist below the icy surface of three of Jupiter's four Galilean satellites (moons). These moons, shown to scale in this 1997 composite, and in increasing distance from Jupiter, are (left to right): Io, Europa, Ganymede, and Callisto. Satellites of the Outer Solar System Planets. The low bulk density of most of the outer solar system satellites (moons) indicates that they are composed from 30 percent to 70 percent of ice, mixed with higher density rock. The ice component includes water ice, carbon dioxide ice, carbon monoxide ice, and nitrogen ice. Spectroscopic observations and magnetic field measurements taken by the Galileo spacecraft found evidence for the presence of liquid water under the frozen surfaces of three of Jupiter's four Galilean satellites: Callisto, Europa, and Ganymede. In the case of Ganymede, the water appears to be between 145 and 193 kilometers (90 and 120 miles) below the surface. Ganymede, the largest satellite in the solar system, is larger than either Mercury or Pluto. Water ice has also been detected on all of the major satellites of Saturn and Uranus. The exterior layers of Pluto and Triton are composed of nitrogen, carbon monoxide, carbon dioxide, and water ices. SEE ALSO Astrobiology: Water and the Potential for Extraterrestrial Life ; Comets and Meteorites, Water in ; Earth: The Water Planet ; Earth's Interior, Water in the ; Mars, Water on ; Volcanoes and Water. Beatty, J. Kelly, Carolyn Collins Petersen, and Andrew L. Chaikin. The New Solar System, 4th ed. New York: Cambridge University Press, 1998. Cattermole, Peter. Venus. Baltimore, MD: Johns Hopkins University Press, 1994. Dasch, Pat, ed. Space Sciences. New York: Macmillan Reference USA, 2002. Spudis, Paul D. The Once and Future Moon. Washington, D.C. and London, U.K.:Smithsonian Institution Press, 1996. The term "water ice" may seem redundant to most people, because frozen water is commonly encountered on Earth. Yet within the solar system, gases such as carbon dioxide, carbon monoxide, and nitrogen can exist as ice on the surface of planetary bodies. Hence, the descriptor "water ice" is necessary to distinguish it from carbon dioxide ice or other icy forms.